The Orange Chef recently closed a $1.2 million round led by Google Ventures, and its new iPad-connected food scale, the Prep Pad, is about to hit the market. The San Francisco startup is well on its way to establishing its technology bona fides in the quantified kitchen. It may surprise you then to learn that the Orange Chef was never supposed to be a tech company. When Santiago Merea founded the startup in 2011, he intended it to be kitchen accessories outfit — more Martha Stewart Living than internet of things. He was watching his wife cook from a recipe on her iPad, and to protect the tablet from spattering grease and flying garlic bits she covered it in a Ziplock bag. That’s where Merea got the idea for the Chef’s Sleeve, a form-fitting envelope that protects your iPad even as you pinch and scroll your way through recipes with batter-covered fingers. The Orange Chef followed up with other iPad cooking accessories, including a tablet stand and cutting board with a built-in iPad dock. “The iPad is a very useful tool in the kitchen,” Merea said. The Orange Chef’s goal is to build accessories and kitchen gear that made the iPad even more useful for cooking, but ultimately the company “wants to be a kitchen brand, not a technology brand,” Merea said. It’s safe to say, however, that mission is evolving with the introduction of its newest kitchen accessory. 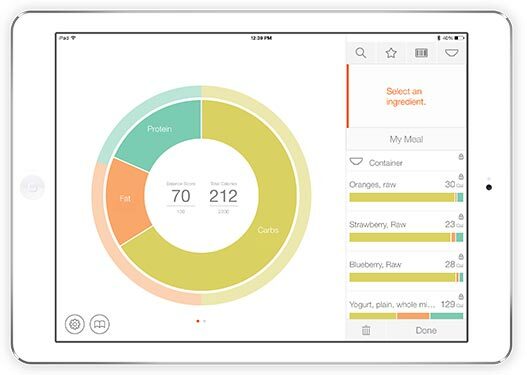 Instead of creating a kitchen scale that merely complimented the iPad’s design, The Orange Chef designed the Prep Pad to connect to the iPad through Bluetooth, as well as an iOS app called Countertop that parses the nutritional content of your food. By tapping into USDA databases, the app can tell you how many calories are in a bowl of strawberries or how much fat is in half a Snickers bar by merely setting them on a scale. Such a scale would be highly useful for dieters, and Merea acknowledged many people will use it for that purpose, but The Orange Cook’s bigger plan is to make the Prep Pad a kind of virtual cooking assistant. As a scale, the Prep Pad is essentially a sensor and since it knows what it’s weighing it can help bridge the precise world of food and recipe data with the not-so-precise world of actual food. What do I mean by that? Take salt: a teaspoon of one brand’s kosher salt could be twice as dense — and thus have twice the sodium — as a teaspoon of a competing brand’s. Or vegetables: Produce doesn’t grow in uniform sizes. When a recipe calls for an onion, does it mean that little 4 oz. Spanish onion in your pantry or the monster pound-and-halfer on your counter? Even cooking methods depend on so many variables. A pork chop might take 2 minutes to sear on a cast-iron pan on a hot range, but four times as long on a steel pan over a weak burner. But by bringing connected sensors into the equations, The Orange Chef can remove some of those variables. Starting with the Prep Pad, cooks not only can precisely weigh what they’re making, but because it knows what it’s weighing it can adjust other ingredients accordingly. As ingredients are added to the Prep Pad, the Countertop App could guide you through the subsequent steps of a recipe. The iPad’s camera acts as a barcode reader, which can analyze the actual brands of ingredients you’re using, knowing for instance that you would need to add more Diamond Crystal salt to a dish than you would Morton’s. According to Merea, The Orange Chef plans to add other sensors to its repertoire, starting with an instant-read thermometer late this year. Its ultimate goal is to work with kitchen appliance makers and even cookbook publishers to integrate their gadgets and recipe content into its Countertop platform. It’s a pretty ambitious plan and I wish The Orange Chef luck, but I must confess my interview with Merea raised some red flags. Merea is bent on building this grand connected kitchen under The Orange Chef’s banner, its products and ultimately its technology. The problem is this kind of top-down approach rarely works. As I wrote a few years ago about my attempts to digitize my recipe library, the world of food is not only extremely fragmented, it’s extremely territorial. The recipes I love are divided among hundreds of cookbooks, dozens of websites and apps; just as the kitchen appliances, pans and utensils I use come from many different companies. I may very well buy The Orange Chef’s Prep Pad because it’s a useful tool unto itself, but I’m skeptical that single company can tackle the monumental task of creating a universal connected kitchen.